The Jewish Studies Program at Wake Forest University emphasizes Jewish history, religion, thought, texts, literature, the arts, traditions, and the ways that they have formed in the context of various civilizations from antiquity to the present. Judaism and Jewish civilization developed—and continue to do so—as a result of its interaction with other religions and cultures. The minor explores Jews and Judaism within the broader context of world civilizations across the spectrum of the arts, humanities, and social sciences. It links disparate fields of study that are usually examined separately, and complements already existing areas of interest in a number of majors and disciplines such as American Ethnic Studies, History, International Studies, Medieval Studies, Politics and International Affairs, and Religious Studies. Our interdisciplinary approach exposes students to a wide range of disciplines and gives students the opportunity for synthesizing and critically reflecting on their course of study. 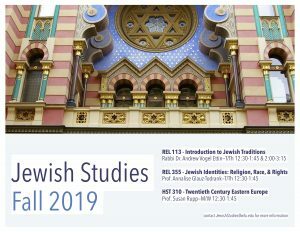 The Jewish Studies minor provides interested students a grounding for graduate study in the humanities, religion, and social sciences. The program director maintains a complete list of all approved elective courses. Interested in learning more? Email JewishStudies@wfu.edu for more information.